"I created this recipe myself with a few tips from my mom and grandma. 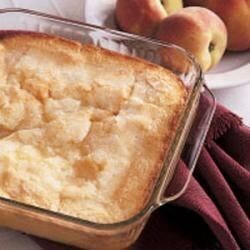 Because it's so quick and easy, this cobbler can be made in minutes to suit any occasion. I've used it for a breakfast fruit dish, dinner dessert and light snack." Pour butter into a shallow 2-qt. baking dish; set aside. Drain peaches, reserving 1/4 cup juice. In a saucepan, bring the peaches and juice just to a boil. Meanwhile, in a mixing bowl, combine 1 cup sugar, flour, milk, baking powder and salt; mix well. Pour over butter in baking dish. Spoon hot peaches over batter. Sprinkle with remaining sugar. Bake at 400 degrees F for 25 minutes or until cake tests done. Serve warm.